This was my first read by Beth Ehemann and it certainly won’t be my last. Having since been told that this book is a spin off from The Cranberry Inn series it seems I have my work cut out in catching up with this band of merry men. It was the synopsis that drew me into this book, having worked in sports management for most of my working life I am always intrigued to see if an author gets it right and while sports management is mainly the back drop for this book what I did read rang true. 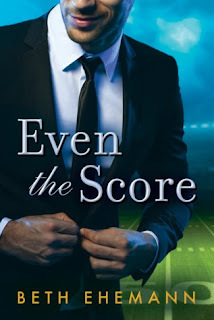 For me though this book was more a romantic suspense, a genre that I seem to be reading more and more of and it is the suspense element that more than ever seems to keep those pages turning. With this one however, I guessed from the off who the stalker was and while I was beside myself for getting it right, I then had the niggling thought, I never get it right so it must have been obvious. However, this was one swoony romance and who in their right mind can resist a single dad…there is something about them that gets my heart thumping and Andy more than stepped up to the plate. The world of sports management is a twenty-four-seven job, especially being an agent. Clients pay good money and expect a round the clock service. The more successful Andy got, the more clients came Andy’s way, the more and more time he spent at work, which in turn meant less and less time with his kids. Andy was a divorcee who had custody of his young kids and it was something that couldn’t continue, the looks in his kid’s eyes was destroying him as he let them down time and time again. Andy realises that something has to give and one of his best friends comes up with the idea of him taking on a new agent to spread the load. Danicka Douglas was a highly successful and very rare female agent. A woman that made her success through sheer hard work and determination and was actually flourishing in a male dominated job. Her resume was the only one that caught Andy’s eye and so she was hired. While the attraction between the two is instant, these two keep their thoughts and feelings to themselves for a long time, but with a chemistry that just got stronger and stronger the more they work with one and another you just knew that they wouldn’t be able to keep it to themselves for too long and I was itching for that moment to happen. This book was refreshing in so far that Andy wasn’t one that had played the field since his divorce. His first priority were his kids and his love life was the furthest thing from his mind. So you knew, that Danicka was something special from the off, she was the first woman that had turned his head and the first woman to make him want to take that first step since his ex-wife. These two had their concerns and they were justified, but sometimes you just have to take that leap of faith. You know what your heart feels and wants and what anyone else thinks can go to hell. The slow burn between these was tangible, I felt their connection, their hesitation, their reticence. I understood and I was just pleading with the pages to make them see the wood for the trees. The banter between Danicka and Andy and all the other characters in the book was fantastic and really made this a light hearted read in places which was a great balance to the suspense element. As I intimated above, there is a stalker who is out for Danicka’s blood and this plot line runs throughout the majority of the book. While I guessed who the perpetrator was, being made to wait till the end to see if I was correct was as exciting as it was frustrating. While I guessed, my rationale behind my thoughts was totally different to the one presented and I did think that the reason given was a bit unbelievable. The kids in this book are adorable and the family unit as a whole was great to read about. The kids were a huge part of this story and their thoughts and feelings always came first and foremost. I really enjoyed this book and as I said above I will definitely be checking out The Cranberry Inn series, it seems I have a lot more books to read.